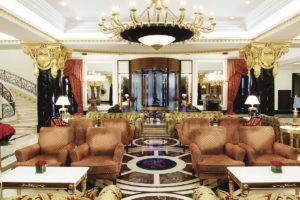 Ararat Park Hyatt and The Ritz-Carlton Moscow are both situated in the very center of Moscow, near Kremlin and the Red Square, Bolshoi theatre, most of government buildings and historical sights. Lotte Hotel Moscow completes the top 3 of Moscow. It is situated near Arbat and US Embassy. Red Square, Patriarshe ponds, Cathedral of Christ the Saviour as well as Strelka are in 15 minutes of walking. There are also popular hotels like opened in 2012 InterContinental Moscow Tverskaya or Radisson Royal Hotel (one of The Seven Sisters, a group of famous seven skyscrapers), Swissotel Krasnye Holmy orBaltschug Kempinski. Kadashevskaya Hotel is situated on the embarkment, 10 minutes walking from both the Red Square and Strelka, where many bars are located. Location of Mercure Arbat is clear by it’s name. Mercure is an international chain of hotels, there are nearly 750 of them around the world. Aquamarine Hotel is one of the most booked places in Moscow. It is located in a quiet district of the city, 15 minutes walking to the Red Square. Other good choices are Courtyard by Marriott Moscow City Centre, Novotel Moscow City (located in business district) or Best Western Vega Hotel (low prices, although far from city centre). 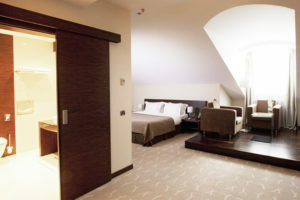 Azimut Moscow Tulskaya Hotel is a contemporary-style hotel situated 5 metro stops from the Red Square. Ibis Moscow Centre Bakhrushina is located much closer to the city center, 5 minutes to Tretyakovskaya Gallery, 10 minutes to Strelka. Other good choice is Ibis Moscow Paveletskaya, one of the most booked places in Moscow. Hostels in Moscow are quite young business which is grown up by young and ambitious people who care about the image and popularity of their work. 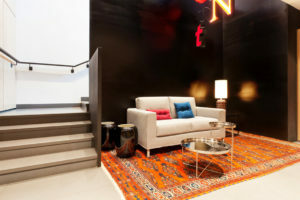 Hostels in general are budget but still comfortable apartments.